Our Book Club will be launching our new season on Wednesday, October 6th with a pot luck dinner at CCR member Margot de Meo's house. I have the great pleasure to announce that we will have a guest speaker at our first meeting of the season; journalist, writer Lady Alexandra Richardson who will be speaking about her book "Passionate Patron: The Life of Alexander Hardcastle and the Greek Temples of Agrigento". In 1921 Captain Hardcastle came to Italy to embark upon work at Agrigento's Valley of the Temples that would be ambitious, inspiring and very much in the mold of the English gentlemen-traveller of yesteryear. At the site of this ancient Greek settlement by the shores of southern Sicily, Hardcastle swiftly began a bold and sustained excavation and restoration campaign such as it had never seen. Lady Richardson became interested in the excavations at Agrigento while living in Rome during her husband Sir Tom Richardson's posting as British Ambassador to Italy. His Excellency will also be attending. All members & guests are welcome to join our pot luck dinner and hear about the excavation done on this important archaeological site. Wanted in Rome has a review of the book: Hunting for Captain Hardcastle. 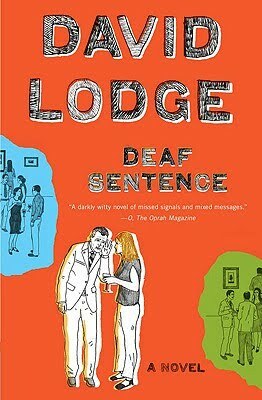 our October book choice - David Lodge's "Deaf Sentence"
to the potluck dinner & discussion. The CCR Book Club is welcoming back old members and encouraging new members to join us in discovering both new and familiar authors over the next eight months. We will be discussing our first book for this year "Deaf Sentence" by David Lodge (2008) at this first meeting as well as proposing new titles for the year.